Editor’s Note: This article appeared in the March 2004 issue, to mark the 50th anniversary of Milan High School’s boys state basketball championship. Some five-and-a-half million people lived in Indiana in 1985, the year Angelo Pizzo and David Anspaugh, two Indiana natives, returned to their home state to make a movie. Inspired by the Milan High School basketball team’s 1954 state championship, it was the first feature-length film Pizzo had ever written and the first Anspaugh had directed. Of the nearly 200 cast and crew members they employed, about 80 percent were from Indiana—that’s in addition to the hundreds of extras cast as spectators in vintage gymnasiums around the state, the 1,000-plus onlookers who filled Hinkle Fieldhouse for the movie’s climax, and the thousands of small-town residents who offered up their communities as film locations. By our math, about one out of every 500 people you pass on the street in Indiana appeared in, worked on, or witnessed the making of Hoosiers. Little wonder, then, that we claim the movie as our own. Yes, it’s replete with images of barns, cornfields, podunk towns, and basketball goals on dirt courts—nearly every timeworn Indiana stereotype. But the movie also represents much of what’s good about the state while conveniently bypassing its less virtuous realities. From the bucolic opening montage to the final game-winning shot, Hoosiers love to love Hoosiers, often in spite of ourselves. For the millions of Americans who don’t call Indiana home, particularly the ones who, in a USA Today poll, voted Hoosiers the greatest sports movie of all time, the film transcends the state for which it was named and the team that inspired the tale. It is a classic underdog story whose characters have become icons: Jimmy Chitwood, the hoops savant; Coach Dale and Shooter, flawed men trying to wrest their lives from inner demons. Clearly, one man’s corn can be another’s inspiration. At sporting arenas around the country, it’s not unusual for Jumbotrons to play clips of Coach Dale firing up his Hickory Huskers with a pregame speech. New York Yankees owner George Steinbrenner has been known to compare his management decisions to those of Hickory High’s principal, Cletus. Last year, Ron Hunter, coach of the IUPUI Jaguars, made his team watch Hoosiers before taking on number-one seed Kentucky in the NCAA men’s basketball tournament. Despite the controversy, Sports Illustrated recently ranked Hoosiers sixth on its list of greatest sports movies (perhaps what kept it from the top spot was its synthesized soundtrack, which was nominated for an Oscar in 1986 but now sounds like it was composed in, well, 1986). But Hoosiers’s legacy transcends the world of movies. If not for Hackman, Hopper, and the boys, one has to wonder if SI would have named the 1954 Milan Indians its 12th-favorite sports team of all time, or if ESPN would have named them the third-greatest clutch team. To the extent that Milan’s victory inspired Hoosiers, one could argue that Hoosiers returned the favor, enshrining the game in the country’s collective sports-history consciousness. And here, to mark the 50th anniversary of the game that Hoosiers celebrates, former Milan players and the film’s cast and crew hold court on making a sports movie for the ages. It was in the late 1960s that Pizzo and Anspaugh, then undergraduates and film buffs at Indiana University, first found cinematic inspiration in Milan’s 1954 state-championship run. After leaving IU, the two remained close, attending film school together at the University of Southern California and later making it as contemporaries in the movie business. ANSPAUGH (director): Angelo and I first discussed making this movie late one night in a living room during college. We were bullshitting around, and one of us said, “God, wouldn’t it be great to go to Hollywood and get in the movie business?” And the other said, “Yeah, and wouldn’t it be great to make a movie about Milan High School?” We got all excited, but then we thought, Nah, who would ever care? PIZZO (writer, co-producer): I always wanted to tell a story about basketball in Indiana, but it turned out the Milan story wasn’t really that compelling—I think every state has one of those. I remember talking to people at film school at USC, and no one seemed interested. But I still wanted to capture the fabric and texture of Indiana and the people who lived there at the time. ANSPAUGH: We kept the idea alive for years, but the catalyst was really Breaking Away. We had talked to a film professor about a movie based on our fraternity experiences at IU, with a subplot about the Little 500. He told us we were out of our minds. Then about six weeks later Breaking Away came out, and that was it. Angelo said, “First chance I get, I’m going to sit down and write that movie about Milan.” I think he was working for Time-Life Films, which was bought out by another company shortly thereafter. He got a nice big severance check and decided it would be a perfect time to write the basketball movie. PIZZO: It was an experiment for me to write a screenplay because I had never done one. I’d learned in screenwriting class that drama derives from conflict, so when I started doing research, I asked Gene White [a member of the original Milan squad] if everybody on the team had gotten along. He said everybody got along fine. I asked about conflicts between the players and the coach. He said, no, they all liked the coach—except that sometimes Bobby Plump was late for practice and the coach made him run laps. I thought, there’s no movie here. That’s when I decided to do something inspired by the Milan story and create the characters from scratch. I just went off and started writing, and it was a terrible experience. I hated every minute of writing that script. I didn’t know what I was doing. My first draft was 230 pages long, and it was a total mess. I wrote everybody’s story. I mean, do you really need to know about the cheerleaders’ lives? By 1982, Pizzo had a script and a director, but the movie was a hard sell. Few executives wanted to back a period sports flick set in a Midwestern backwater. Most studio types were even less enthusiastic about entrusting the director’s chair to Anspaugh, who had experience directing dramatic series such as St. Elsewhere, Hill Street Blues, and Miami Vice, but had never done a major feature film. Finally, in 1985, after passing up offers to sell his rights to the film and fielding rejections from several studios, Pizzo found a production company, Hemdale Film Corporation, that would allow him to retain creative control. He and Anspaugh first envisioned Robert Duvall as Coach Dale, but Gene Hackman reportedly accepted far less than his normal asking price to take the role. The filmmakers were determined to cast real basketball players to make the game sequences realistic. California native David Neidorf, who passed up a role in Ferris Bueller’s Day Off (later filled by Charlie Sheen) to appear in Hoosiers, was the only professional actor among the Hickory players. The rest were kids from Indiana, and two of them, Wade Schenck (“Ollie McClellan”) and Kent Poole (“Merle Webb”), were farm boys not unlike the characters they played. PIZZO: The one person probably most responsible for getting the movie made was Jack Nicholson. Because he and I were friends, he was the first person we took the script to. David and I brought it to his house, never presuming he would even remotely want to be in the movie. I just wanted him to read it and give us some feedback. We spent most of the afternoon there watching TV and swimming, and we didn’t really talk about the script until shortly before we left. A couple weeks later I got a phone call from him, and the first thing he said was, “I’ve got to play that coach.” That raised interest around town. But he was asking for a lot of money at the time, and people were nervous about putting up that kind of money. Then Jack called and said, “Hey, guys, I’m involved in a lawsuit with MGM and I can’t work on another film for six months. So take it out, and if you find somebody else you like for the role, you have my blessing.” Gene Hackman was the next person to read it. ANSPAUGH: I ran into Dennis [Hopper] at a restaurant, and I had never met him before. He was heading out the door, so I stepped in front of him and introduced myself—probably scared the living daylights out of him. He was very nice, but said something like, “Yeah, man, okay, whatever, send the script.” So I did, and two days later he was in my office and he sat there for three hours. We gave him the part of Shooter right on the spot. The first actor we had contacted for the part was Harry Dean Stanton, but Harry’s agent passed on it. I ran into Harry a couple of months after the movie came out, and, oddly enough, he was with Dennis. When we started talking, it turned out Harry had never even known he had a chance to be in Hoosiers. His agent hadn’t sent him the script. I can’t begin to describe the look on his face. NEIDORF (“Everett Flotch”): Hoosiers was just another audition. I was 22, and I’d never had a job. They were casting in Los Angeles, trolling around among all the young actors—I remember seeing Chad Lowe at one of the tryouts. When I auditioned, David [Anspaugh] said that as soon as I did, he knew I was Everett [the son of alcoholic assistant coach Shooter], but he had to confirm it at a basketball tryout at a local Y. I had been playing in the park before that, so I wasn’t a total spaz on the court. I could make it look like I knew what I was doing. I probably wouldn’t have gotten the part if I hadn’t been playing in the park. MARIS VALAINIS (“Jimmy Chitwood”): I think originally they tried to cast the basketball players in Los Angeles, but they were getting a lot of actors who couldn’t play ball. I think that’s why they came to Indiana, to get basketball players and make them into actors. SCHENCK (“Ollie McClellan”): My brother, who was a couple years older than me, was going to Butler University. There was something in the student newspaper about tryouts for a basketball film. My brother went the first day and knew I was talking about making the trek to Indianapolis to try out, too. So he called me that night and said, “Wade, don’t bother. There was like 400 kids there. It was a joke.” I thought, Oh, well, I get a day off school anyway, what the heck? PIZZO: I knew we were going to cast real basketball players and not actors in the roles of the team members. So I wrote parts that were not heavy-lifting acting-wise for any of them, especially for Jimmy Chitwood. I wanted to make him all about behavior, all about action. I think he has two or three lines in the whole movie. PIZZO: I immediately felt that Maris was Jimmy when I saw him. He had the face, the innocence, the kind of opaque quality I had imagined in the character. And he had the pure shot. He had it all. The Hoosiers crew had to scout locations as well as actors. Having abandoned the true Milan story far a fictional account, Pizzo and Anspaugh were free to make a film more generically about Indiana high-school basketball in the 1950s, and they set about finding settings that retained their ’50s look. The historic Knightstown Gym, chosen as the fictional home of the Hickory Huskers, was later saved from demolition largely because of Hoosiers. The town has since renamed it Hoosiers Gym, and it’s a tourist attraction for movie-lovers from around the country. RAY CRAFT (the only former Milan player to appear in Hoosiers): The first time I became involved in the movie was when the crew came to do preliminary work. They came to the IHSAA [where Craft worked] because they wanted to see film of the Milan game and the clothing and uniforms people wore at the time. One day I went with them in an airplane to find a site for the town and the school. They were looking for a place that didn’t have asphalt, because back then there was only gravel around schools. We also had one of our basketball coaches hold a practice, and Gene Hackman went out and watched for a couple nights to see the way coaching was done in Indiana. ANSPAUGH: We had hardly any input from the original Milan players. Once we decided not to do the Milan story, we had to be very careful. We didn’t want a lot of contact with them, because we didn’t want anyone suing us later, saying, What do you mean this is the Milan story? PLUMP (former Milan star): I heard they were making a picture based on Milan from Roger Schroder, another member of the Milan team. He had picked up a script, and I can tell you, it’s a good thing I wasn’t putting up the money, because when I read it I thought, How in the world can this be any good? I was in some school plays at Milan, and it was hard for me to visualize the movie coming to life. Golly, was I wrong. ANSPAUGH: We wanted to use the gym in Waveland, but we found out they were going to remodel it. The school board had already voted on it. We said, “Do you know what a chance this would be for you?” But they said, “Nope, we don’t want any movie here.” It’s too bad, because Waveland had everything we needed—the town, the gym, the school. Instead, Hickory is a composite of the towns New Richmond, Nineveh, and Knightstown. That might have been a real tourist boon to Waveland. In hindsight, it seems that, in the long run, they probably could have built a much bigger school as a result of the movie. With cast and locations in place, the crew began filming Hoosiers in November 1985—a whirlwind affair that took less than two months to wrap. To keep the whole production together, Pizzo, and Anspaugh scrambled to keep their stars happy, make their young actors behave and enlist help from the locals. PIZZO: A lot of scenes that we intended to shoot outdoors we ended up having to move indoors, because during the six-week period when the movie was shot, I think it rained 95 percent of the time. But that kind of gloomy, dark look serves the film well. It indicates the kinds of lives people lived in Indiana during the winter. ANSPAUGH: Barbara Hershey [“Myra Fleener”] was miserable a lot of the time. I don’t know whether it was Indiana or the weather. It was grim and depressing. And there were really no other women in the movie. She was kind of out there by herself. I think she thought the movie was about her and Gene and forgot about the other people. PIZZO: I don’t believe Barbara had much respect for what we were doing, for us as filmmakers, for the script, for much of anything. She took the job to work with Gene Hackman. I’m sure she was disappointed that three of her scenes were cut from the movie—in fact, I know she was. She has refused to do publicity or make a single comment about the film ever since. SCHENCK: But Dennis Hopper was great. On location, all of us boys shared an RV, and Gene, Barbara, and Dennis had their own. Dennis would invite us over to play cards in his trailer between scenes. You could tell the ’60s had hit him pretty hard. I think Hoosiers was one of the first films he did where he was actually dry. He didn’t drink or do any drugs during the movie, but they had already taken their toll on him. What you see with him on the screen—that’s him. That’s not acting. He’s really out there. VALAINIS: I remember while we were playing cards, Dennis held up his hand like he does, with two or three fingers in the air, and said, “No wild games, man.” He liked to play straight poker. NEIDORF: We went out to some bars with Dennis. He was sober, so he’d order a Coke. He was very friendly to us younger actors. But Gene was pretty intense. Maybe he was trying to keep some distance because he was playing the coach and didn’t want us to be too friendly. I later warned Willem Dafoe [who worked with Neidorf in Platoon and was scheduled to work with Hackman on Mississippi Burning] that Gene loses his temper. After they did Mississippi Burning, Willem came back and said, “Yeah, he lost his temper one day and he was unrecognizable.” Gene’s a phenomenal actor, but he’s not going to be your buddy. PIZZO: There was some friction between Gene and David [Anspaugh] and me. Actors are in a vulnerable position because in the beginning they can’t be quite sure about the guys they’re working with. David had never directed a feature before, and this was the first one I’d written. Gene worried whether we knew what we were doing. ANSPAUGH: Having all the amateur actors also caused friction from time to time. Gene knew what he was getting into, but I don’t think it really hit him until he got there. Sometimes he was really helpful, and sometimes he was a bit standoffish. But that helped the character, because in the movie people never really embrace Coach Dale until the end. It sort of worked. PEG MAYHILL (Knightstown resident): I went over to watch the filming every day, because the Knightstown Gym was right across the street from my house. In a scene where Coach Dale is thrown out of the game, Gene Hackman got up off the bench and walked to the locker room. Then he came out with a chair and threw it the length of the court. This was right after the Bobby Knight chair-throwing incident, and we were just stunned. Nobody knew whether it was part of the movie or what. Then he put his hands on his hips and grinned. SCHENCK: In Indianapolis, the production team rented a hotel and put all the cast and crew there, except of course for Barbara, Gene, and Dennis—they all stayed at the Canterbury while we got stuck in the Ramada. Man, we destroyed them hotel rooms. We all got BB guns and were shooting each other. Shooting out the windows and in the halls. We tore the crap out of that hotel. VALAINIS: Nobody could sit still on the set. While they were shooting a scene, three of us would be over on the other end shooting a basketball and knocking over lights or something. We were always getting in trouble. One of the assistant directors was assigned to keep us out of trouble. NEIDORF: One weekend we weren’t doing any filming, so Wade invited me to his farm. His dad sent us to pick up some grain, and while we were pulling it with a tractor, we hit a bump right in front of the house, and the bin flipped. Wade’s dad must have heard, because he came ripping out there in his pickup. You could tell Wade’s dad was a tough farm guy and that Wade was a little bit afraid of him. We spent a couple hours shoveling that grain, but there wasn’t a lot said. I went to Kent Poole’s house, too. He took me to the coffee shop where the farmers went in the morning. I remember him telling me how important it was that he got to be accepted by the old farmers. He had already been farming for a couple years and was paying his own bills. He had had more of a man’s life than the rest of us at that point. SCHENCK: I grew up in a town with a population of about 800 people. I wasn’t used to crime. I would leave the keys in my car outside the hotel in Indianapolis, and sometimes the other guys would move it around the side of the building so I’d think it was stolen. Steve Hollar (“Rade Butcher”) went out one morning and his car was gone. He thought we was all playing a joke on him. He got mad, but we didn’t know what was going on. It ended up the car did get stolen. They found it downtown, stripped, with no trunk lid, and the T-tops gone. After that I locked my car. Actor input, last-minute editing, and happy accident all left indelible marks on the final version of Hoosiers. When, for example, the filmmakers thought they had it in the can at two hours and 18 minutes, the distributor, Orion Pictures, insisted it wouldn’t release any movie more than two hours long. Ever wonder why, after two players get kicked off the team early in the movie, one (“Whit Butcher”) comes back with an explanation, and the other (“Buddy Walker”) just magically reappears? It’s because Pizzo and Anspaugh had to cut a scene. They’re currently trying to find all the deleted material to include in a director’s-cut DVD they hope is released this year. ANSPAUGH: A scene that was changed during filming was one in which Shooter was supposed to have broken out of the detox ward and appeared in the locker room at the final game. But Dennis, having been sober for about six years at the time, said that if we wanted to believe Shooter is committed to sobriety, then we had to keep him in the hospital. Angelo and I fought it pretty hard at first, but he was dead-on right. Just like the stovepipe hat, another one of Dennis’s ideas. I said, “He’ll never get away with wearing that—he’ll be laughed off the screen.” He said, “Trust me, it’ll work” And it did. PIZZO: A big chunk of what was taken out was the relationship between Myra Fleener and Coach Dale. There were two more scenes that preceded the kiss scene, which formed a natural progression in their relationship and would have made their kiss seem more organic rather than pop out there. Ninety-nine percent of the time, editing glitches are something we know about but just try to slide by. Like the Buddy scene—we know more than anyone it’s not there, but sometimes you have to make a sacrifice and hope people don’t notice. The biggest sequence cut from the film was a series of scenes about a harvest festival. I wanted to show the community coming together to work. It was one of the rare days we had clear skies and a beautiful sunset. The way the fields were shaped and carved—it was a beautiful scene on so many levels. But it didn’t advance the story. Even though I think of it as the best piece of film poetry that David and I have done, it never made the film. NEIDORF: The production company had bought that field, so they could do whatever they wanted. We were running through it, playing tackle football and smashing into the corn. It kind of upset Kent. He was like, “You guys don’t understand, but it’s hard for me to watch this. This is what I grow for a living.” There were all these farmers around, and they had some pretty nasty chaw. I thought, all right, I’m going to do this, too. I chewed for like an hour. When they called us in front of the camera, I turned green and started puking. ANSPAUGH: There was a scene where Maris is shooting on a dirt court and makes like 14 or 15 shots in a row. Everyone who watches the movie assumes that when Hackman walks away, Maris misses the last shot on purpose. But it wasn’t scripted that way. VALAINIS: We actually did the scene in one take, which was kind of remarkable. I think that was my first scene alone with Gene Hackman. It was getting dark, so they had to get the shot. I was nervous because I felt the pressure to get it done. Gene started his speech, but I wasn’t even listening to him. I was just concentrating on making baskets, and luckily I made a lot in a row. When I heard him finish his speech, I thought, Okay, the scene’s over—I’m done, then I missed the last shot. It was purely accidental. I just stopped concentrating because the speech was done. 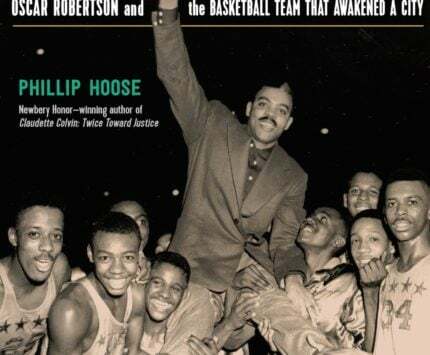 SCHENCK: The underhanded free throw is the little shtick everyone remembers about Ollie, but that wasn’t in the script, either. I was trying to figure out how to make my shot look bad, because when you’ve been to basketball camps and taught to do everything right, it’s hard to look like you don’t know what you’re doing. So we was talking about it, and someone said, “What about an underhanded free throw?” It just kind of stuck. Now it’s the thing everybody remembers. People say, “You’re the guy who shot those underhanded free throws!” I still get razzed about that. MAYHILL: There was one thing I thought was a little out of line. The movie had people in the crowd wearing overalls. I’m 83, I’ve been going to ballgames since I was 6 years old, and I don’t remember ever seeing anybody at a ballgame in overalls. Maybe since a lot of the crew was from the city, they assumed that all country folks wore overalls. Filmed in the same hallowed hall as Bobby Plump’s famous game-winner, Jimmy Chitwood’s final shot in Hoosiers has become something of a legend among the cast and crew. PIZZO: We were blessed by the number of extras who showed up throughout the film, except at Hinkle Fieldhouse. We expected a lot of people, but when we put out a call, only 200 or 300 people showed up. We didn’t know what to do—we thought we wouldn’t have an ending. We had to shoot one little corner that day and desperately tried to figure out other ways of getting people in. A crane operator came up with the idea of scheduling a game between the top high-school teams in Indianapolis and then shooting the crowd afterward. Which is what we did. What we had planned to shoot in four days we ended up shooting in a day. We still had only about 1,000 people, and we had to move them from corner to corner and shoot real right. ANSPAUGH: I asked Bobby to come out on the floor and show me exactly where he took his famous shot. PIZZO: Plump did point to where he made the shot, but we didn’t like where it was, so we moved it farther out. We thought it would be more dramatic. ANSPAUGH: I put down a piece of tape and had Maris start warming up from that spot. The assistant director came over and said, “Mr. Hackman knows you’ve been busy, so you probably haven’t noticed that Maris hasn’t hit one shot from that spot you gave him. Mr. Hackman thinks you should move him up closer.” I casually looked out of the corner of my eye—I didn’t want Maris to know I was watching—and sure enough, he was throwing up bricks. He was probably nervous because he was about to take one of the biggest shots in Indiana basketball history, second only to Bobby’s. I thought, If I move him up, it might shake his confidence even more. I thought I’d give him a few shots at it. But when we got the cameras rolling and the extras on their feet, wouldn’t you know—first take, boom, nothing but net. VALAINIS: Right before we filmed the scene, the casting director came up and said, “You’re not even looking at the basket when you shoot.” So I got the ball, and I was remembering what he had told me about looking at the basket. I looked at the basket and ended up hitting it on the first take. It felt like I had just won the state championship. ANSPAUGH: I thought, My God, I forgot to tell everybody what to do when the ball went in. I had just assumed it wouldn’t. So everything you see in the movie—the cheerleaders crying, the South Bend Central players pounding the floor, Ray Crowe consoling his players, all of our guys jumping up—that was totally spontaneous. I was on a walkie-talkie to all the cameramen, and when they ran out of film, I told them to reload and keep shooting. All that stuff you see when the ball goes in is pure, unbridled hysteria and joy. They were cheering for him in real life to make that shot. After finishing production of Hoosiers, Pizzo and Anspaugh had a hard time getting Orion to back a national release. It wasn’t until the film had run for several months and grossed close to $30 million that Hoosiers proved it had legs. Encouraged by its success, a few of the amateur actors who’d played on the Hickory team took a shot at show business. Poole made a brief appearance in Anspaugh’s next film, Fresh Horses, and Valainis played Liberace’s chauffeur/lover in a TV miniseries. PIZZO: Everything that happened to us was a surprise. Even when we finished the film and the test-market screening scored high numbers, Orion didn’t trust that they could sell it. If it didn’t do well in Indiana, they were not going to go national. So we released on Thanksgiving weekend, 1986. David and I went to Indiana three weeks prior and got a hold of every television and radio station and every newspaper reporter and talked about how important it was for people to go to the theater that first weekend. We were trying to enlist the support of Hoosiers to get behind the movie. It was like running a campaign. It turned out we were in the theater for something like five months. I thought once the movie was out of theaters, that would be the end of it. But it has sustained in ways that have blown my mind. It started becoming a joke—“the movie that will never die.” It’s amazing that I’m talking to you about it almost 20 years later. VALAINIS: I talked to David Neidorf and Gene Hackman, and they said I would probably get work out in California. They felt I had enough talent. But Hoosiers didn’t have such a cult following then. I wasn’t as well-known when I first came out, even after the first couple of years. It was tough. I was going on auditions all the time and I didn’t know the business. I was in Casualties of War with Sean Pen and Michael J. Fox, and I got to go to Thailand for about eight weeks. I was in a movie called Combat Academy with George Clooney. I’ve had a chance to work with a lot of very good actors, who continued to go on to lots of successes. I wonder why I can’t. NEIDORF: Even though I’ve lost all my hair and now look like a man, if someone’s going to recognize me it will be for Hoosiers. I was at a Dodgers game last year and heard somebody whisper, “That’s the guy from Hoosiers!’ It’s always a pleasurable thing to be recognized when you’re kind of an ordinary, run-of-the-mill actor. If it makes someone happy, then yeah, I’m the guy from Hoosiers. But I’m surprised by how long the fascination with it has lasted. It escapes me a little bit. VALAINIS: I get requests from coaches to come out and talk to their teams. People get pretty excited when they realize who I am. I get recognized every once in a while. Being Jimmy helps when I play pickup ball, because I get a lot more respect. They’re afraid of my outside shot, which makes it easier for me to drive around them. If they do leave me open, I’ll hit a couple jumpers. PLUMP: After I graduated from Milan, I was giving 10 to 15 talks a year at high schools and clubs. It was starting to die down, to eight or nine appearances a year before the movie. But since Hoosiers came out, I get requests constantly. It’s probably back up to 15 or 20 a year. I’ve talked to people from Milan who say they won’t see the movie because it doesn’t mention the town. And there were mixed reactions from the team, a couple of players who felt the way the people of Milan did. But I think the movie brought the Milan story into focus for younger generations. PIZZO: We won the USA Today poll for best all-time sports movie. How could anyone anticipate that? We thought we were making a small film. Our attempts were modest. There’s nothing that special about it. What I think makes the film different is the period. Athletics today is so rife with problems—money, drugs, egos. All of those were largely absent back then. There’s a tremendous nostalgic feeling for a time when there was a kind of purity of purpose, a simplicity to life. It is very appealing to live in that world for two hours.